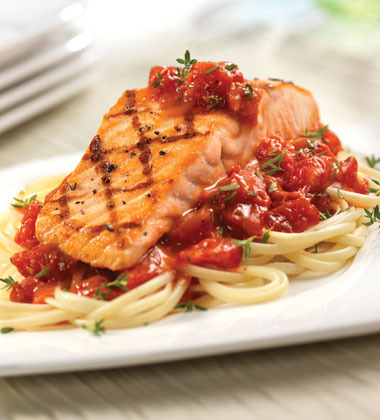 Grilled salmon, fresh thyme and a zesty tomato base make this pasta dish a fresh favorite. salmon fillet, 4 oz each	 20 ea. diced tomatoes, drained	 2 lb. 2. 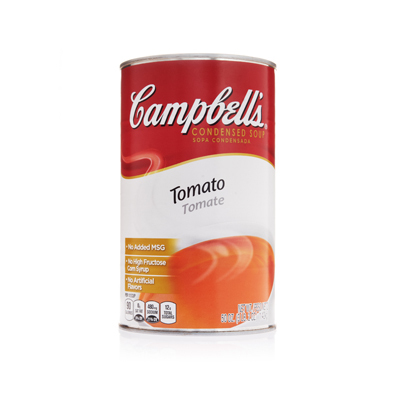 Mix soup, water, parsley, Italian seasoning, and diced tomatoes. Bring to a simmer. 3. Grill salmon 8 to 12 minutes or until fish flakes easily when tested with a fork and internal temperature is 165ºF or higher for 15 seconds. dried parsley flakes	 3 tbsp. dried thyme, leaves, crushed	 3 tbsp. black pepper, freshly ground	 1 tsp. 4. Place 4 oz. hot linguine on a plate and top with 2 oz. of tomato sauce. Sprinkle with Parmesan cheese and top with grilled salmon. Add 1 oz. of sauce on salmon and fresh herbs. Using cooked whole grain pasta (1/2 cup per serving) will contribute 1 oz grain equivalent toward Child Nutrition Meal Contributions.